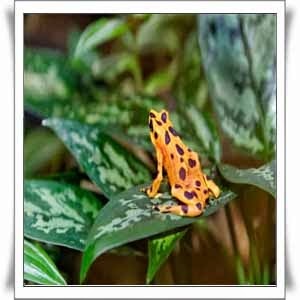 Panama golden frog (Panamanian Golden Frog) is an animal frog golden yellow with purple-black leopard that lives in the country of Panama. To evolve with increasingly extreme habitat, frog uses a special language. But unfortunately this beautiful animal is almost extinct due to habitat loss. Panama golden frog lives only in the rainforests of Panama, especially those living near the river flowing and around waterfalls. Due to the extreme environmental noise in their natural habitat, the golden frog is evolved with a special ability that is quite rare in the animal kingdom. They make use of a semaphore as a special language. Semaphore is a basic form of sign language used by these frogs to communicate on a basic statement, for example, the desire to mate or warning to potential rivals. An amazing form of evolution for these frogs to adapt to extreme habitats. Male golden frog also has a tendency to make a whistling sound, although his voice is basically completely useless for this type of frog species have no membrane in the ear drum.